We’re seeing that the aircraft sales market is improving, at least for some aircraft, as evidenced by the number of transactions we’re completing at DJI. Improvement has been particularly dramatic in the first quarter of this year, especially since the first two quarters of each year are traditionally slower – there is generally a push of transactions in the last quarter of each year. 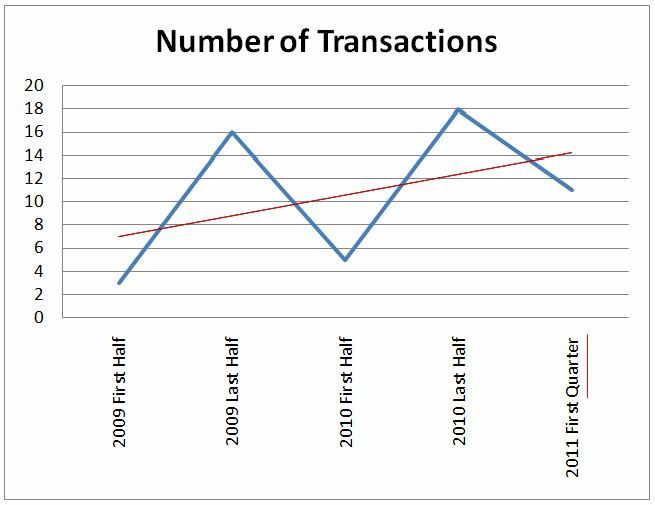 You can see from the chart that first quarter sales for 2011 have eclipsed the first half year in the previous two years. The trend line displayed is conservative, since the last period reported is a quarter rather than a half year. 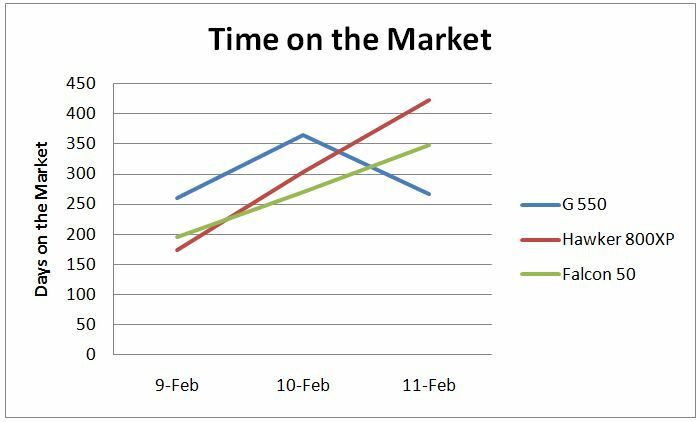 Other brokers are reporting similar results. 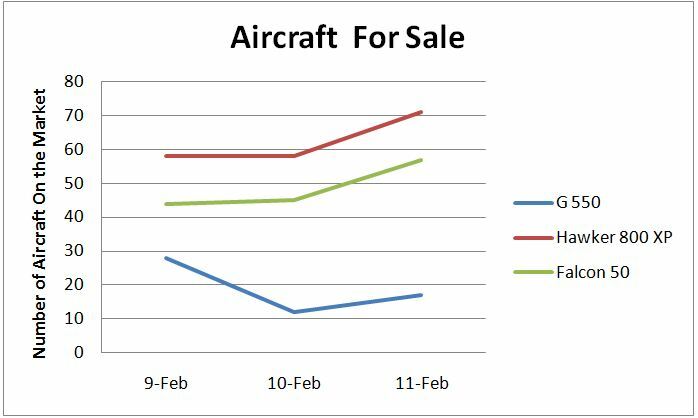 This is a good sign indicating aircraft values will improve as surplus inventory is sold. Buyers are back in the game, but they are being selective. Demand is improving most for large cabin aircraft that are well-equipped, low time, and newer than 10 years old. Demand for small to mid-cabin and older aircraft remains flat to slightly appreciating. Demand is still depreciating for aircraft older than 20 years that are higher time and less well-equipped. A Gulfstream 550 is a newer, large-cabin aircraft. 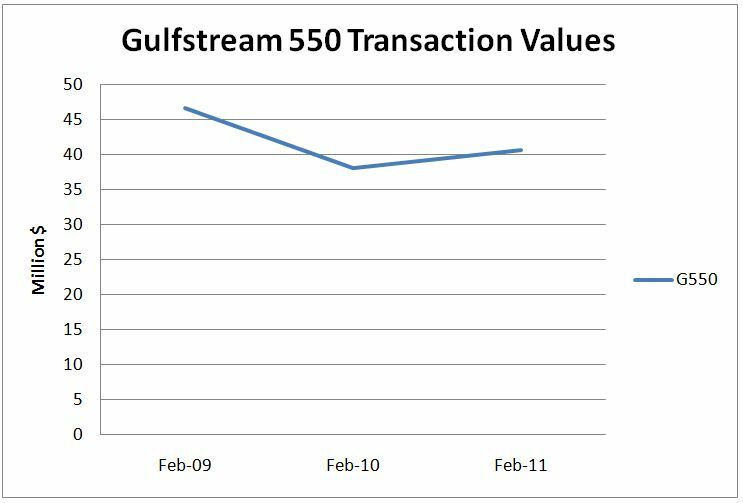 We saw the values dip in 2010 and then begin to recover in 2011 as pictured above. This chart shows the continued (but possibly reducing rate of) decline of values of mid-sized, older aircraft. The Hawker 800XPs on the market tend to be in the range of 10 years old or so, and Falcon 50s were made until 1996 (replaced by the Falcon 50EX) and are therefore at least 15 years old. 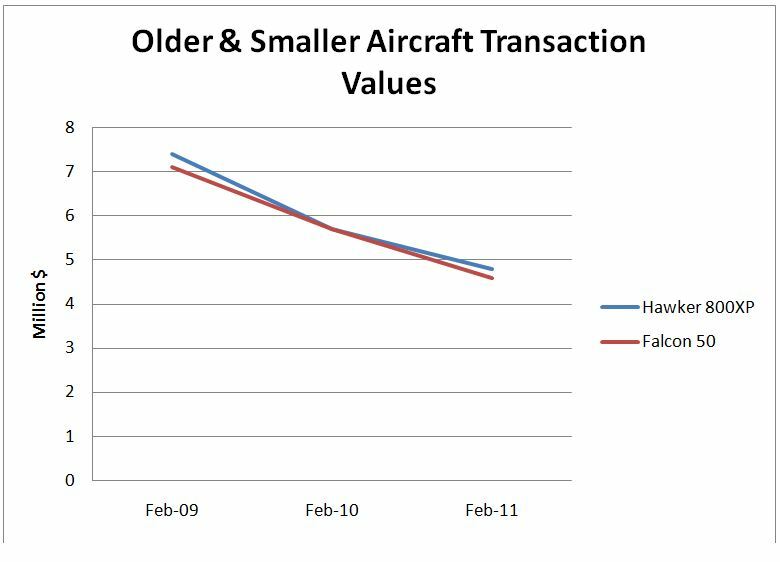 Again, we see that larger, newer aircraft are spending less time on the market than mid-sized older models. We see owners re-entering the market, up from a low in 2010. While demand will continue to strengthen for large, new aircraft, we suspect that prices will remain low for the smaller, older aircraft for the near future due to the increasing number of aircraft entering the market. Of course, you don’t always have a choice of when to buy or sell an aircraft. The market is one of many factors you need to consider, as well as your business transportation needs, budget, cash flow and other timing considerations. We use extensive, custom research to make the most successful transaction possible out of every aircraft purchase or sale. If you have the option, now is a great time to sell if you have a larger, newer, better–equipped aircraft. Now is a great time to buy if you’re looking for a mid-size or smaller cabin, older aircraft.